War intensified in Libya in the period between the United Nations–brokered national dialogues of September 2014 and January 2015. More than a thousand people died, many cities were shelled by artillery or hit by air strikes, oil terminals were set alight and the economy continued to collapse. Disagreements emerged within Libya’s warring camps, and external players continued to meddle in Libyan affairs. On 29 September 2014, the western Libyan city of Ghadames hosted a national dialogue initiated by the United Nations (UN) that brought together parliamentarians from Tobruk’s parliament (House of Representatives, HoR). It faced criticism from Tripoli’s Libya Dawn. UN Secretary General Ban Ki Moon visited Tripoli on 10 October, accompanied by the Italian minister of foreign affairs, but refused to meet with the authorities there, restricting his meetings to the MPs participating in the national dialogue. That was the first round, which lasted just one day. Violence doubled afterwards. The most important battles took place in Benghazi, the second largest city in Libya and its eastern capital, which was taken over by the forces of the Islamist organization Libya Dawn during the summer of 2014 and was gradually occupied by more extreme forces, including Ansar al-Sharia and affiliates of Islamic State (IS). He relied also on media and social-media propaganda outlets to disseminate the news, intensifying his attacks on that day. His strategy adopted the US “surge” model of increasing forces and relying on local support. “Citizen groups,” mostly former soldiers and lumpenproletariat, joined in and began guerrilla actions against Libya Dawn in Benghazi. By the end of October 2014, the city was largely under Haftar’s control. More than 500 people had died. A similar action was planned for Tripoli, shaken by airstrikes and intermittent clashes in December, but Tripoli’s “liberation” never happened, due to the strength of forces from Misrata garrisoned in the city. Tripoli’s government (as opposed to the internationally recognized government in Tobruk, headed by Prime Minister Abdullah al-Thini) proved resilient. Haftar also tried, unsuccessfully, to capture the crossing of Ras Jedir, on the Tunisian border. By the end of December, Libya Dawn was firmly in control of the coastal strip from Tripoli to Tunisia. Attacks by Libya Dawn reached Tobruk, where a bomb wounded three MPs, as well as the Abrug airport, one of Haftar’s main air-force bases. On 24 October, a balance of power seemed to emerge, when a Libya Dawn plane struck Zintan, the westernmost city affiliated with Operation Dignity and the headquarters of the “Tribal Army.” Airstrikes had, until then, been the monopoly of Haftar and his allies. Libya Dawn’s real counteroffensive began on 14 December, when Tripoli’s parliament (the General National Congress, GNC) launched Operation Sunrise, meant to “protect” the so-called Oil Crescent of Libya’s east, located between Benghazi and Tripoli (Briga, Ras Lanouf, Sidra). Operation Sunrise is an extension of Libya Dawn, using ground, sea and air forces. Sidra, the largest oil-export port in the country, was partly destroyed and millions of oil barrels burned. Oil facilities in the south, under Zintani control, were also besieged by Libya Dawn. Haftar retaliated by striking the city of Misrata for the first time. 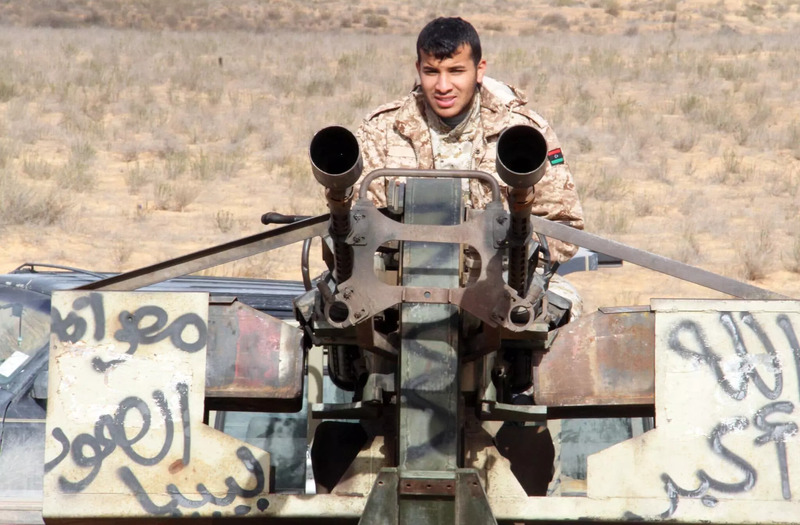 Misrata is seen as the economic capital of Libya Dawn and has supplied troops to Tripoli. Other conflicts—ethnic, political and economic—emerged in Libya’s south (Sebha, Ubari) and west (Kekla). They are loosely connected to the northern conflict between Libya Dawn and Operation Dignity; they wreaked havoc on several regions, resulting in hundreds of deaths. There are about 300,000 displaced persons in Libya, and about two million have fled the country (out of a population of six million). Several thousands died, 80% of Libya’s airports were destroyed in 2014 and journalists face assassination and kidnapping. 2015 will be another difficult year. Things were no brighter on the political level. The HoR, which was elected in June 2014, and its majority party, the National Alliance of former prime minister Mohamed Jibril, quarreled with Prime Minister Abdullah al-Thini. There were also disagreements between Jibril (i.e., the parliament) and Haftar and between the latter and al-Thini’s government. By October, Haftar announced that he would resign the leadership of Operation Dignity. Soon, however, the HoR declared that Haftar and his militia were part of its forces. He and his officers were no longer “renegade” or “retired” soldiers but the official army of the internationally recognized government of Libya. The speaker of the parliament, Aguila Salah Issa, met with Haftar on 25 October in Baida, where the parliament regularly convenes. Tripoli’s government began to pay wages to functionaries and to run the state’s affairs. Tripoli’s prime minister al-Hassi condemned HoR speaker Salah Issa’s call for foreign intervention. In November, the Constitutional Court cancelled results of the June election and dissolved the HoR. The court was perceived as one of the last neutral institutions of the country, but, because of its location in Tripoli and the anarchy prevailing in Libya, the decision went uncontested. But divisions were emerging inside Libya Dawn as well, especially among its Islamists, split between the Muslim Brotherhood, al-Qaeda and IS, but also between them and the less ideological and more economically motivated Misrata elite. Their international allies, moreover, were reaching out increasingly to their enemies: Qatar, Turkey and Sudan are consulting with the politicians from Tobruk regarding a peaceful issue to the conflict. Tobruk leaders paid several visits to Cairo, stressing military and intelligence cooperation. This has spurred anti-Egyptian reaction from Libya Dawn, including, harassment, assassinations, and kidnappings. The assistance of the United Arab Emirates (UAE) to Haftar continued to grow and was revealed on at least two occasions: a ferry loaded with military pickup trucks was exposed in December, and a cargo plane carrying weapons was later hijacked by Libya Dawn. Egypt, the UAE, Saudi Arabia and Algeria coordinate and agree on intelligence and political affairs in Libya; their Tripoli embassies have been attacked in recent months by suspected affiliates of Libya Dawn. By the beginning of 2015, Libya’s economy, the largest in the Arab world, was estimated to have shrunk by about 30%. Inflation was about 5%, and the budget deficit increased by more than 50%. The country produces less than 900,000 barrels of oil per day (compared to 1.65 million in 2010, the year before the revolution) and, with the global oil crash, oil income has been halved. UN envoy Bernardino Leon has been meeting with various parties since September: the GNC speaker Nouri Bousahmin and Prime Minister al-Hassi, HoR speaker Salah Isaa and Prime Minister al-Thini, General Haftar, and others. After several postponements, the national dialogue of Ghadames was finally followed up by the Geneva Meetings, which were convened on 14 January at UN headquarters and were considered Libya’s last hope.